As summer approaches on the west coast especially, folks start to think about chilled bottles of friendly bubbly to accompany their out-door activities, talking about hanging pool side on warm summer days, flute in one hand and a bag of truffle oil coated popcorn in the other. That said, I've got a timely article written by guest contributor; Kim Johnson the author of D'Vine Wine Time Communications a blog known for bringing "affordable California wines; to meet everyday people”. Also be sure to follow her on Twitter where you can also catch her snarky one-liners and delightful wine-chatter most Wednesday evenings, where she's a frequent participate in the lively conversations around what has become the vino water-cooler. So Kim when did you first develop interest in Cava? When I noticed the schedule listing "Cava" for #winechat [and Cuvee Corner hosting] well, I knew I could not miss it. My only pitfall was I did not know the first thing about Cava, therefore did not buy anything to partake in that particular night, but learned SO MUCH that evening and that's where Bill at Cuvee Corner stepped up to help teach me more"
In my twenty plus years of drinking & enjoying wines, I have not had the opportunity, nor knowledge to try the beautiful Spanish Sparklers known as Cava. My friend here at Cuvee Corner recently encouraged me to give it a try for the first time. Running with Bill's wonderful Cava recommendations, I picked up a bottle of Segura Viudas Aria Brut and a bottle of Berberana Gran Tradicion Brut Rose Cava, one a blanc from blanc and the other a Rose, allowing for a fun little comparison. 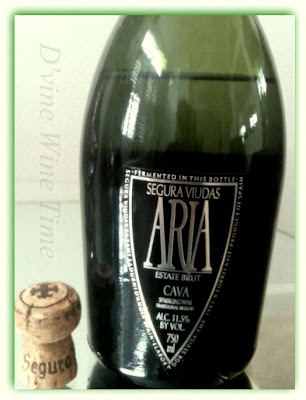 First out was the Segura Viudas Aria Brut. It poured with strong bubbles and a beautiful straw pale yellow color. After the bubbles settled a bit, the nose on this wine was a wonderful apple with slight melon. My first sip was impressive! It was citrus; apples and pears with a finish that had herbal/mineral notes. It was full bodied; crisp with balanced acidity and a long finish. I could not ask for more out of a dry bubbly! I had done a little reading on this Cava before trying it so I could make a feeble attempt of making something from scratch to pair with it. I concluded that apples and cheese would be a worthy try and successfully paired this Segura Viudas Aria Brut Cava with a Apple/Brie Tart. It was a fabulous pairing, a real crowd-pleaser for very little "Cha-Ching". After the first Cava, I was hooked and being reeled in, I could not wait to try the Berberana Gran Tradicion Brut Rose and the next day did not come soon enough. The Berberana Rose Cava was a a "Girl's Pink" [you know, like Victoria's Secret in a bottle]. This Cava is a blend of 70% Monastrell and 30% Pinot Noir, so it's obvious where the wonderful color comes from. The nose on this one was fruit forward with pears and berries with a slight floral note in the background. Again the fruit was also forward on the palate with raspberries and pears. It was much bigger on the acidity and tartness than the Segura Viudas Aria Brut with a medium body and a long finish. This sparkling Rose was "winetastic", I knew right away that it would be so much fun to enjoy with Sushi, but did not get that opportunity. Instead I paired it up with a appetizer of Prosciutto Wrapped Roasted Asparagus Spears. In a word DELISH, the acidity in the wine and bubbles matched up great with the saltiness of the Prosciutto, made for a most wonderful Cava and a exceptional value. So, which did I like best? Hmmm...really a tough choice. Both were so exceptional - but if I were to only pick one; I'd say for me the Segura Viudas Aria Brut. I really thought I'd love the Rose more but the white brut surprised me a bit and was truly a Cava delight. Both were truly awesome and you would not be steered wrong either way - the price points on both are under $10 which to me is an amazing value. I'm so very thankful to Bill at Cuvee Corner for his encouragement and recommends on trying Cava. It took this California wine drinker to Spain and back through a bottle of bubbles for this first time (and not the last time) as a Cava drinker. It also brought me to my other "first time experience" to be able to share my tasting experience as a guest post on Cuvee Corner...it's been an honor....Thank You Cuvee Corner readers and a "Cava Cheers" to you all! Is cava the same as cuvée? A tricky question, but no Cava is Spanish bubbly, similar to Champagne being French Bubbly. But of course not all bubbly comes from Champagne alone, other French bubbly is known as "Mousseux" or "Crémant". Now that said, most Cava's that you will find are a blend of the the three traditional grapes; which are Viura (aka Macabeo), Xarel.lo, and Parellada. But I have seen some modernist bottling Chardonnay and calling it Cava. A "cuvée" simply means it's a blend.Cuvée-labeled wines will usually be special blends or selected vats of higher quality wines or they are just labeled as a field blend. I hope that helped? Cheers!